By Melissa Lennig on March 8, 2013 4 Comments. This content contains affiliate links. As an Amazon Associate I earn from qualifying purchases. When I was in 4th grade, I read Little House in the Big Woods by Laura Ingalls Wilder. The scene that has stayed with me since then was the one in which the Ingalls Family poured hot maple syrup into the snow to make candy. I’ve always wanted to do that! This morning, we awoke to a foot of fresh snow—a sugar snow—and I knew it was the perfect morning to boil and cool pure maple candy, for the very first time. I boiled 1 cup of our homemade New Hampshire Maple Syrup on the stove until it was bubbling and creeping up the sides of the pot, adding a slice of butter to prevent it from boiling over. When it looked ready, I dropped a small bit of the hot syrup into a cup of cold water to test it. The syrup immediately crystellized into a hard ball. 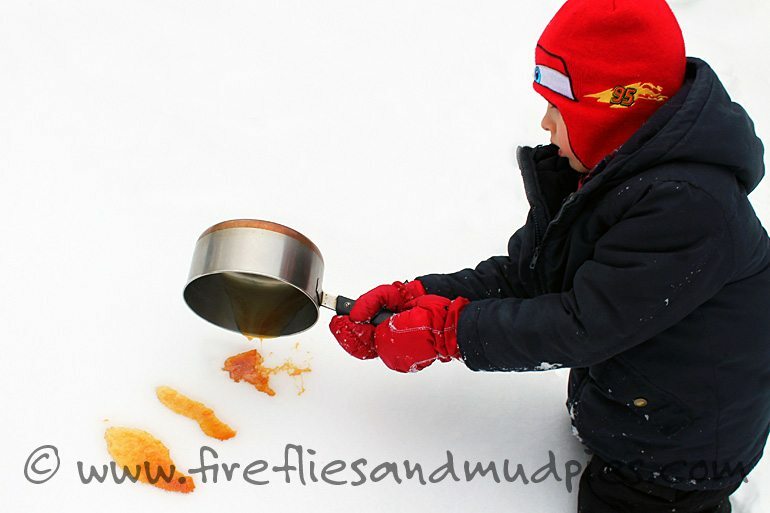 I took the hot syrup outside to where the boys were playing and invited my oldest son to pour it into the snow. The syrup rapidly hardened into solid candy. The boys scooped it out of the snow for a taste. 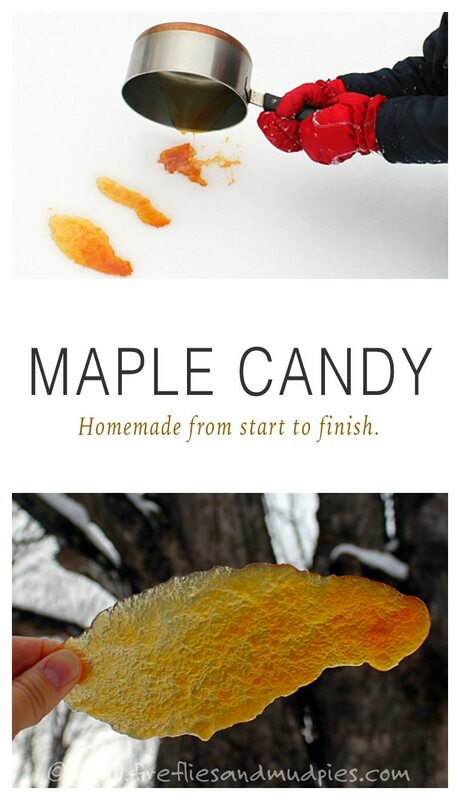 The amber candy tasted just like sweet maple syrup. “But better because it lasts longer!” stated my youngest. 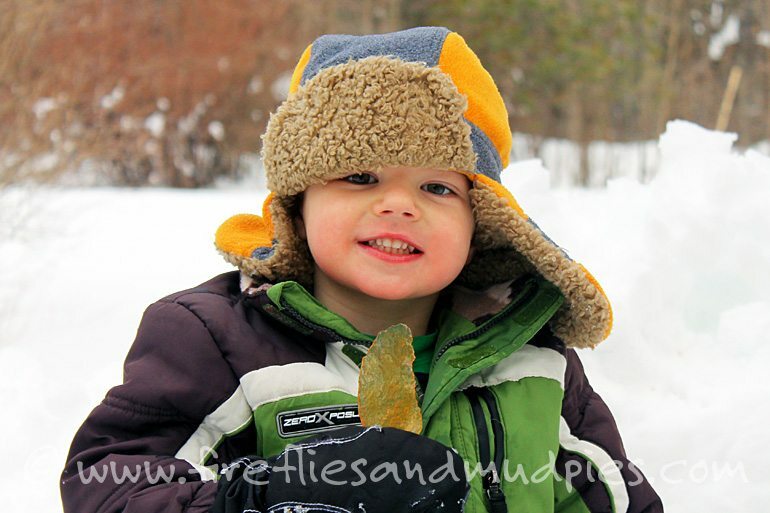 As my boys relaxed in the snow enjoying the pure maple candy we created from start to finish, I couldn’t help but feel proud of the rich New Hampshire traditions we’ve immersed ourselves in. I imagined children, from generations past, enjoying the very same candy my boys were tasting for the first time…perhaps on the very same land! 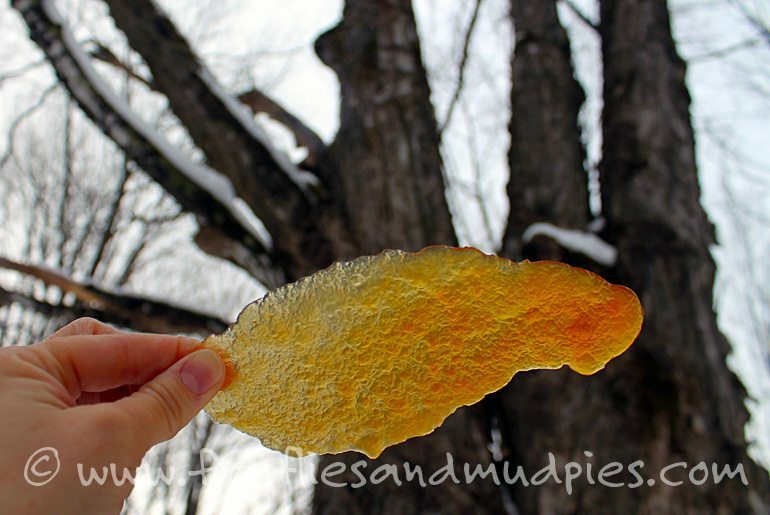 Pure Maple Candy shown in front of the very tree it came from! Wow, I love it! I was a big fan of Little house of the Pairie too – but infortunately don’t think we’ll ever get this much snow to be able to do this. 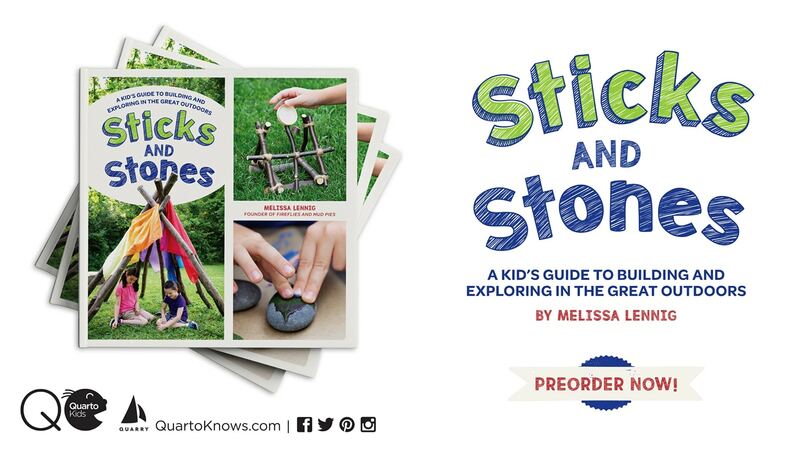 Thanks so much for adding this to the outdoor play party. Thank you for hosting the outdoor play party! I love linking up to it.